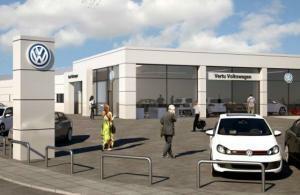 Work has begun at Vertu's Volkswagen Nottingham North showroom, which will see a £1.4 million redevelopment programme completed before the end of the year. The car dealership on Mansfield Road in Daybrook, Nottingham will be given a brand new glass-fronted showroom, with a dedicated display area for up to 11 new vehicles. It will also have enough space to accommodate its ever growing team of staff at new offices on the same site, as well as state-of-the-art facilities for customers. Customer service has become more and more important for car dealers across the UK, as increased competition from online vendors has eaten into the dealership market. Offering extras such as aftersales servicing and test drives is even more vital than ever. So, in addition to general motor trade insurance and road risks insurance, dealers should consider demonstration insurance too, to ensure they are covered for test drives whenever they are requested. The new facility in Nottingham will see Vertu measure up to Volkswagen’s most recent guidelines for franchises across the country. There will be luxury offices spread across the ground and first floors to give customers a fully confidential sales experience. Additionally, the new facilities will offer a new carwash and valet service, along with refurbished sales and aftersales areas. Mark Dale, the general manager at Vertu Volkswagen Nottingham North, said of the £1.4 million investment: “We’re very excited to begin the major refurbishment. The old dealership looked tired and the new site is going to look fantastic. The brand new showroom is particularly eye-catching and the new offices will offer a comfortable and confidential sales experience for customers.